Research shows that at around the age of two 70% of cats and 80 % of dogs have some sign of dental disease. Problems usually start with plaque that hardens to form tartar on the teeth. If this is not removed, this can lead to gingivitis, a painful condition of inflamed gums, and eventually periodontal disease may develop. Pets can loose teeth and could form other health problems to other organs of the body if their teeth are not kept clean and healthy. 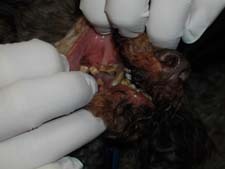 The following examples are signs to watch for if your pet is starting to experience some dental issues. If you notice these signs please contact our office and we will be glad to set an appointment to have an exam done on your pets teeth. Every regular annual vaccination exam in our hospital includes a thorough dental exam. We’ll also at that time recommend a home care program to help you keep your pet healthy. If we find dental disease, we will recommend a treatment plan for you. If you have noticed the tartar build up recently and your pet is not due for their annual exam for awhile, please contact our office so that we can have your pet seen The earlier you treat dental disease the better the outcome is for your pet’s teeth and gums. Just like their owners, pets eventually build enough tartar on their teeth to require a professional cleaning. Our hospital provides this service for your pet and will go over the full procedure during the dental exam. Your pet will under go anesthesia for this procedure, because unlike their owners, our pets will not lay still long enough for their teeth to be cleaned and polished. makes effective home dental care as easy as feeding your pet. Ask us about the dental pet food options available for your pet at Village Veterinary Hospital. Dental disease doesn’t just affect the mouth? There are several ways it can interfere with your pet’s overall health and quality of life. Dental disease can lead to problems in the heart, liver, kidneys and other organs. Plaque is a colorless film containing large amounts of bacteria that builds up on your pet’s teeth. Plaque can cause infection, destroying gums, bone and other tissues that support the teeth. Your pet’s mouth may develop wounds that allow the bacteria to enter the bloodstream and spread throughout the body. If you have any questions regarding your pet’s teeth or you would like to have an exam done for you pet, please contact our office at 505-869-2627.